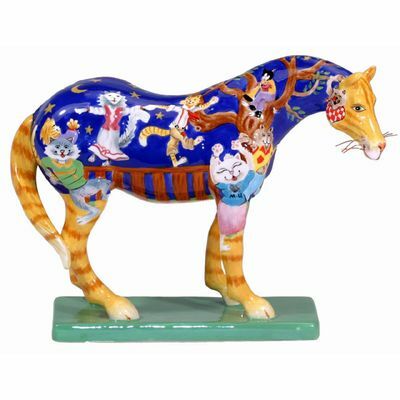 Kitty Cat's Ball | Retired Ponies Figurines | One Price Low Flat Shipping! This whimsical horse figurine boasts a love of cats, topped off with copper whiskers! According to the artist, "Here is what happens when daytime-snoozing feline souls cut loose by the light of the new moon. They jig and waltz, slide a sinuous tango and pound out a mad polka... By day, we only see those half-smiles on snoring kitty faces as they grace our chairs and sofas, or doze in the garden beneath the lilacs. They grin from within as they recall the gavotte from the night before and shiver with delight, dreaming of the next Kitty Cat's Ball."